This application is a SIP softphone. It’s useless on its own, you should have a SIP account to make calls. Telephone gives you freedom in choosing a phone provider with the best prices. Just search Internet for “SIP provider” or see the list of providers that have already been tested with Telephone: http://code.google.com/p/telephone/wiki/ProvidersTested. Please note: to set up Telephone and make calls you need a valid account with a SIP provider. Zfone is a new secure VoIP phone software product which lets you make secure encrypted phone calls over the Internet. Zfone is not itself a VoIP client, but lets you make secure calls with your existing VoIP client, by filtering, encrypting and decrypting all your VoIP media packets as they pass in and out of your computer. You can use a variety of different software VoIP clients to make a VoIP call. It’s as if Zfone were a “bump on the wire”, sitting between the VoIP client and the Internet. Think of it as a software bump-on-the-wire, or a bump in the protocol stack. A public beta release of the Zfone software is available for download for Windows XP, Vista, Mac OS X, or Linux. Zfone runs on Windows XP and Vista, both 32-bit and 64-bit versions. Zfone will encrypt audio and video for Apple iChat calls on Mac OS X. Zfone has been tested with these VoIP clients: X-Lite, Gizmo (audio, no video yet), XMeeting, Google Talk VoIP client, Yahoo Messenger’s VoIP client (for audio), Magic Jack, and SJphone. It does not work with Skype. VoIP tracker is a monitoring application for your VoIP devices (currently only Sipura/Linksys devices are supported). VoIP Tracker displays basic information about your VoIP device so that you don’t have to browse through a web administration interface. – is my VoIP device correctly registered ? – what are the current settings ? 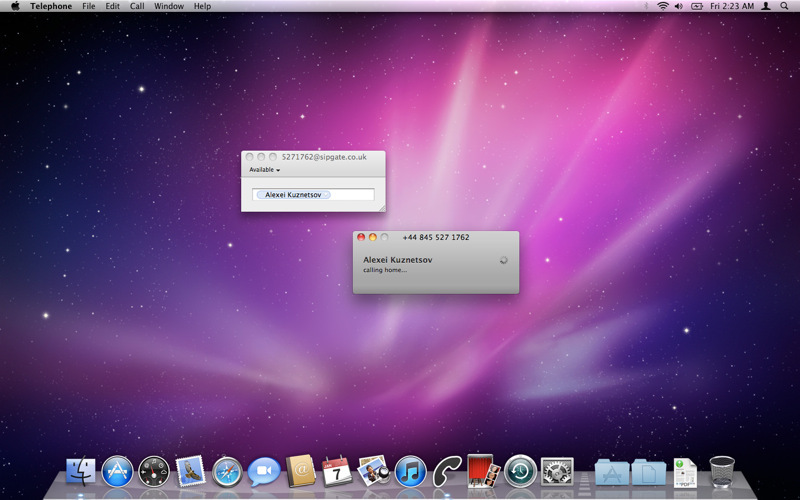 – IF you are using any other good VoIP apps for Mac, then feel free to add your review below.